The Trump administration last week named Georgia Public Health Commissioner Brenda Fitzgerald as the next leader of the Centers for Disease Control and Prevention (CDC), a crucial federal public health agency. The CDC is based in Atlanta, so she won't have to move far. Politico's Morning Agriculture briefing today noted that Dr. Fitzgerald has previously worked with projects that received $1.4 million dollars from the Coca-Cola Company, also based in Atlanta. 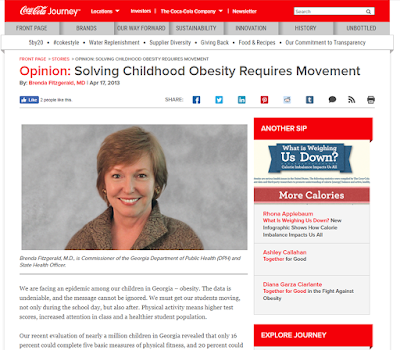 Politico gives credit to a tweet from Russ Greene for noting her contribution of a 2013 column on childhood obesity to the Coca-Cola website. From a sugar-sweetened beverage industry perspective, it's a perfect score. For the United States, trade with Mexico offers many benefits for the economy and dietary quality for American consumers. 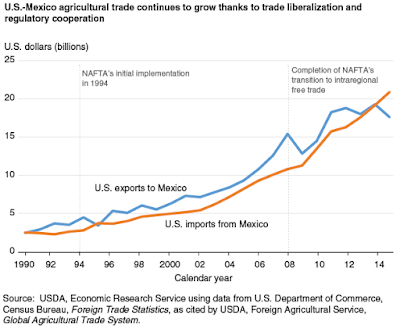 Together, this sweeping trade liberalization and ongoing regulatory cooperation made possible a dramatic increase in U.S.-Mexico agricultural trade. The results included an enormous jump in export sales to Mexico, benefiting U.S. farmers. A chart in the Amber Waves article shows that agricultural trade with Mexico is nearly in balance, with agricultural exports equal to or exceeding imports in most years. USDA's Foreign Agricultural Service has a page devoted to agricultural exports to Mexico, with statistics, links to agricultural trade offices in Mexico City and Monterrey, and a guide for exporters who seek to do business in Mexico. The top 5 U.S. export industries are dairy ($1.3 billion), pork ($1.3 billion), beef ($1.1 billion), poultry ($1.0 billion), and prepared food ($707 billion). Producers in these industries are important to the U.S. agricultural economy, and they are politically influential. Moving beyond just agricultural products, the office of the U.S. Trade Representative (USTR) has a web page devoted just to trade with Mexico. For U.S. producers, Mexico was the second-biggest export market in the world. Total U.S. trade with Mexico is more in balance than trade with several other countries. In 2015, U.S. exports to Mexico were an astonishing $240 billion, almost double our exports to China. Meanwhile, U.S. imports from Mexico were $294 billion, much less than our imports from China. Our trade deficit with Mexico is just $54 billion (much smaller than our deficit with China, Germany, or Japan, for example). For nutrition, federal government sources place a heavy priority on increased consumption of fruits and vegetables. For example, the Healthy People 2020 initiative lists fruit and vegetable consumption as "Leading Health Indicators" and proposes ambitious goals for increased consumption. USDA data on food imports show that fruit imports from Mexico increased almost 6-fold from 2000 ($0.8 billion) to 2014 ($4.7 billion). Similarly, vegetable imports from Mexico increased 3-fold from 2000 ($1.7 billion) to 2014 ($5.4 billion). With increased tariffs or reduced trade with Mexico, fruit and vegetable prices in the United States would be much higher. The consequence of reduced agricultural trade with Mexico would be that Mexicans would have more fruits and vegetables (and less beef, pork, and processed food), while U.S. consumers would have less fruits and vegetables (and more beef, pork, and processed food). 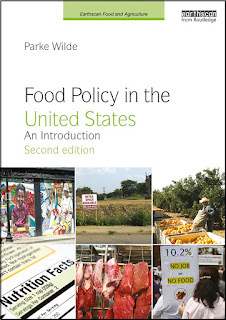 I always read with great care the large literature by public interest advocates who raise serious concerns about agricultural trade with Mexico. For example, Tom Philpott at Mother Jones describes conditions for agricultural workers in Mexico as "heartbreaking." Food and Water Watch argues that provisions for sanitary/phytosanitary rules in existing and proposed trade agreements are too weak. I hear the point of each, and yet think that reduced trade is not the remedy. I do not think the workers in Tom's story are helped by shutting down the U.S. Mexico border, and I think Mexico is capable of producing food to the same standards as producers in Florida or California. Looking forward beyond the hardships that excellent public interest sources have noted, we can improve labor and food safety standards without exaggerating differences across the border as if we had our own house fully in order. In short, U.S.-Mexico trade is important and beneficial to the U.S. economy and nutrition. You can hear this view from me, and (as of this writing) you can hear it from the steady, sober online data sources maintained by the federal government. The Tufts/UConn RIDGE Center seeks to support innovative economic research on domestic nutrition assistance programs and to broaden a network of researchers applying their expertise to USDA topics. 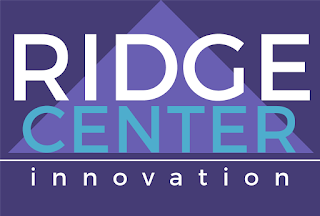 The RIDGE Center seeks applications from a diverse community of experienced nutrition assistance researchers, graduate students, early career scholars, and established researchers who bring expertise in another research area. Full details are available in the 2017 Request for Proposals (RFP). Additional information will be provided during the RIDGE Center Information Webinar for Applicants, Thursday, February 2, 2017 at 2PM EST. Please provide your email to receive information on joining the webinar. Medford, Mass./Hartford, Conn.- A new center at Tufts University and the University of Connecticut will focus on economic research aimed at enhancing food security and dietary quality for low-income Americans through the nation’s nutrition assistance programs. The research center brings together the Friedman School of Nutrition Science and Policy at Tufts and the UConn Rudd Center for Food Policy and Obesity, two institutions with long records of research leadership in this area. The Tufts/University of Connecticut RIDGE (Research Innovation and Development Grants in Economics) Center will be funded by the U.S. Department of Agriculture (for one grant cycle immediately and potentially up to 3 grant cycles in total). Parke Wilde, associate professor at the Friedman School, will serve as the RIDGE Center Director, and Tatiana Andreyeva, associate professor in the UConn Department of Agricultural and Resource Economics, and Director of Economic Initiatives for the UConn Rudd Center, will be the RIDGE Center Associate Director. The new RIDGE Center funding offers an exciting opportunity for a diversity of new and experienced researchers in the area of nutrition assistance, including the Supplemental Nutrition Assistance Program (SNAP), the Special Supplemental Nutrition Program for Women, Infants and Children (WIC), and child nutrition programs. The Center will help connect researchers from around the country to current information about USDA program and policy interests, offering promise for sound research with real-world usefulness. 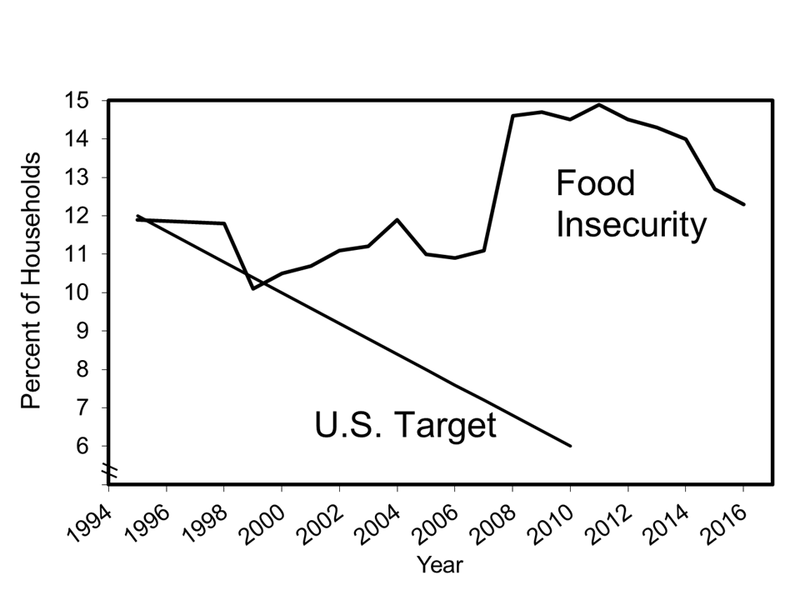 Despite occasional claims to the contrary, farm subsidy programs have little impact on food consumption, food security, or nutrition in the United States. It might surprise you to hear that this is a widely held view among researchers and policy analysts in agricultural economics. Interestingly, it depends little on a person's political ideology. There is no poverty and nutrition alleviation rationale for U.S. farm subsidies because they do not have any meaningful effects on poverty. These programs simply transfer government monies mostly to well-off folks who can afford competent lobbyists but are in no need of government handouts. Now, a study by three leading experts shows that federal farm subsidy programs such as crop insurance don’t help feed hungry Americans either. 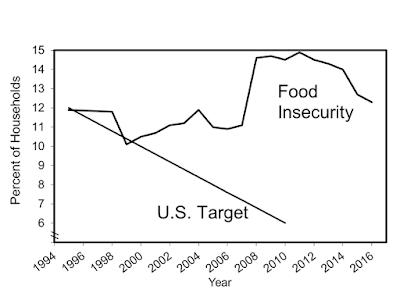 An analysis by Joseph Glauber, Daniel Sumner and Parke Wilde for the American Enterprise Institute confirms that farm subsidies don’t improve food security for poor Americans – even for those who live in farm country. 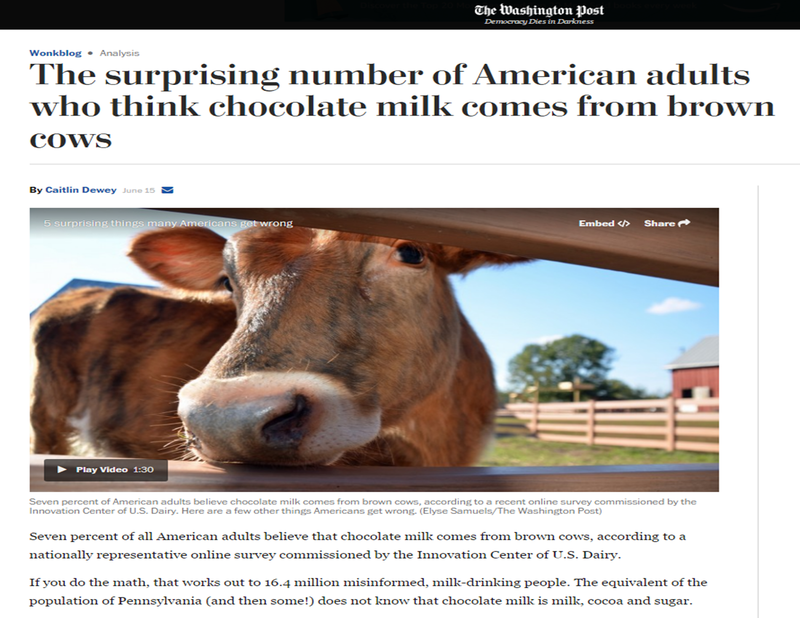 Before reaching our conclusions, Joe, Dan, and I tried to contemplate a wide array of ways that somebody could say farm programs help the nutrition status of the poor in the United States. For example, perhaps the programs lower prices of beneficial foods (but they don't), or perhaps they help the income of poor farmers (but they go mostly to more prosperous farmers), or perhaps they help farm workers by increasing labor demand in certain industries (but the least labor-intensive industries get more subsidies). In a spirit of open communication across diverse traditions, especially this particular week, I look forward to participating in the AEI event this Monday, Jan 23, connected with the release of this report. First, let me review the harsh back and forth in a somewhat typical week of debate about sugar sweetened beverages (SSBs) in the Supplemental Nutrition Assistance Program (SNAP). 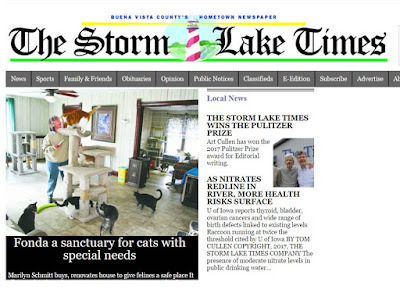 The New York Times this week published an article about "lots of soda" in the shopping carts of SNAP participants. This drew fire from the magazine Jacobin ("Reason in Revolt"), where Joe Soss noted several problems with the NYT article. For example, the NYT listed "milk" first among beverage choices for nonparticipant households, but the original USDA study (.pdf) showed no significant difference in the ranking of food choices for participants and nonparticipants. The NYT reporter, Anahad O'Connor, said "cities, states, and medical groups" have urged changes to SNAP, such as restricting soda purchases. Meanwhile, O'Connor said, industry organizations have spent millions opposing the changes, so USDA has refused to approve the proposals. One would think from the NYT article that all the good folks favor the restrictions, and all the bad folks oppose. O'Connor didn't say that the list of supporters for such proposals also includes conservative critics of SNAP, who sometimes include such proposals in an agenda that also has budget cuts, nor that the list of opponents includes anti-hunger organizations, who are concerned that the proposals would increase program stigma and food insecurity by discouraging participation among eligible people. In truth, people who care about poverty, hunger, and health are painfully divided about SNAP restrictions. Second, let's consider a different approach to this policy discussion. I have a wish that leading anti-hunger organizations would more sympathetically consider supporting a pilot project that includes SNAP restrictions. Here is a draft set of principles, which, if met, might make such a proposal deserving of support by anti-hunger organizations, legislators who care about food security, and the USDA. the research protocol has a trigger, enforced by the Institutional Review Board (IRB), ending the pilot in the event of any evidence that the pilot proposal threatens household food security. I wish such a pilot SSB restriction were not caught up in our poisoned partisan struggle over the safety net more broadly. This is merely a small reasonable revision of the definition of SNAP eligible foods to exclude soda. It is not about "banning" soda, just about altering what can be purchased with SNAP benefits. If the proposed policy turns out to threaten food security, almost everybody in the public health nutrition community would drop their interest in it. And, if the proposal turns out to be successful, and perhaps even popular with SNAP participants themselves -- who may appreciate the health halo associated with the revised program -- then it may merit support within the anti-hunger advocacy community. Update (Jan 19): A clear and empathetic essay from Marlene Schwartz at the Rudd Center published yesterday in the American Journal of Preventive Medicine. the Atlanta History Center, famous for Civil War memorabilia and the Margaret Mitchell house, but which also was packed with Hispanic visitors on the day I visited, because of a special program for Día de los Reyes Magos. the Amtrak Station, because though I am flying less, our divided country fortunately is still bound together by old rusty infrastructure links that predate our current disregard for the environmental challenges of our times. I will try to live the next four years with one foot in our democracy's painful contemporary struggles and the other foot planted in the better America that sometimes is hidden in plain sight. This is how I will try simultaneously to do good and enjoy life. Some may slander this good and profoundly American place, but the 5th Congressional District in Georgia has something to teach us.